One of the most impressive liaison and reconnaissance aircraft of World War Two was the German Fieseler Storch, which possessed amazing short take-off and landing capabilities. Dirk Bende of Kolingwinter, Germany undertook the transformation of a 1945 Morane-Saulnier Criquet to its original Luftwaffe configuration. Nurtured from an early age in the art and science of flying warbirds, Trey Carroll recently graduated to the fraternity of warbird pilots when he soloed in a T-6G. What made the occasion unique was later that day he flew a two-ship formation flight with his proud father. 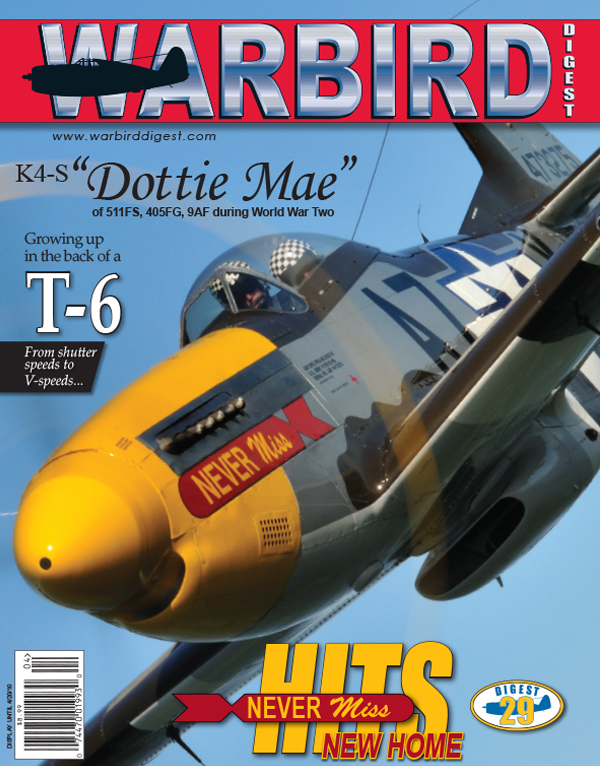 Historian Mark Sheppard tells the story of the most historically significant warbird restoration currently underway. From its final mission on the closing day of World War Two in Europe, to it’s recovery from a cold Austrian Lake, to the current restoration—this report offers everything. As a bonus, Mark provides an insightful interview with Dottie Mae’s original pilot, Mr. Larry Kuhl. The Murphy family of upstate New York owns and flies rare and beautiful vintage aircraft, including several warbirds. The newest addition was possible through a successful partnership between the family patriarch, David Murphy, and Dr. Russell Cecil. Lyle Jansma chronicles the recovery of a cold war relic, an F-89 Scorpion. As winter made a frigid appearance in October of 2009, a dedicated team of volunteers from the Heritage Flight Museum undertook the daunting task of disassembling and transferring the jet from Helena, Montana to Bellingham, Washington. Roy Stevenson discovered a world-class aviation and automobile museum in the small, unassuming town of Hood River, Oregon, where founder Terry Brandt has amassed one of the country’s finest collections of vintage L-birds and trainers.